A fun storyline, where the characters are dropped into a world where their imaginary characters are real. The action is just a little too over the top to be believable, and the characters are rather one dimensional. Of course, *actually* being dropped into a world where the fighting is for real, and you have no idea when…or if, you’ll ever go home, might not actually be all it’s cracked up to be, as one group of friends soon find out. 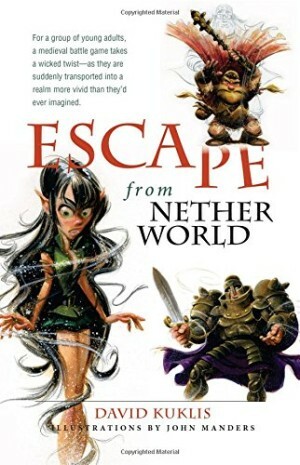 In Escape from Nether World, a group of friends sets out for their monthly role playing session, enacting the scenes from their Dungeons & Dragons games and having a great time doing it. What they don’t know, is that this time will be much different. As the group runs and leaps, thrusting swords and generally having a great time, the ground gives way, dropping them into the caves below. When they emerge, they find themselves in an entirely new world. They have magically transformed into their gaming alter-egos, weapons and all. Though they are at first overjoyed at the opportunity to live out their fantasies, they start searching almost immediately for a way to get home – though that isn’t an easy feat. 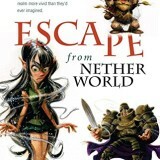 The premise behind Escape from Nether World is a good one – it’s an interesting idea that presents all sorts of opportunities for fun and adventure for the group. There is fun and adventure to be had, and the friends soon find themselves in one adventure after another. And no matter the adventure, from friendly competition to battles to the death, these heroes, completely new to real life fighting and a land of magic, succeed remarkably. They are proficient at pretty much everything. The girls all want them, the fights are all won – it’s all just a little too much to really immerse you in the story, as it just comes across as unbelievable. The leader of the group pretty much abandons his almost fiancèe as soon as she has a few doubts about their new state. The rest of the book involves her chasing after him begging for forgiveness, and him sleeping with a series of girls as he works his way through his feelings for her. Of course, she doesn’t sleep with anyone else, just pines for him and holds no grudges about any of his transgressions. Again, it’s just too over the top, and it doesn’t put the main character in the gallant hero form you’d normally expect. Overall, Escape from Nether World is a fun concept that has some truly enjoyable moments, but it leaves you thinking of what it could have been, rather than being truly great on its own. It’s a fun read for role players and fantasy fans, but doesn’t live up to its potential.